@ventspleen2014 takes a trip to the theatre to see the UK tour of The Woman In Black, how does this classic ghost story compare to the film and the original stage show. With the sequel to The Women In Black about to hit our screens has this dampened the effect of the stage play on audiences.. 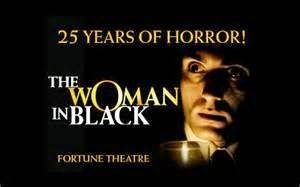 The Woman in Black is celebrating it's 25th Year of residency at The Fortune Theatre, London. For 25 years this tremendous stage show, based on the Susan Hill novel, has terrified audiences. I went to see the show as a teenager and was enthralled by what I saw. As a stage show it's a triumph as most of the scares are created by use of very loud sudden noise (the loud creaking of the rocking chair) and just pure atmosphere. Performed with two actors playing the two characters (Arthur Kips and Kegworth) plus a normally uncredited Woman In Black. It works because of the slow build to the horror and the reveal of Mrs Drablow's dark and tragic past. When the show was transferred to film I was concerned that the menace and simplicity of the show would be lost, as is so often the case, by unwarranted embellishment and showy set pieces. Whilst the cast is certainly expanded and the viewer is shown more than what is displayed on stage (the other tragic child deaths and interaction with other villagers) The film kept true to the stage play in terms of the use of atmosphere and noise to build the suspense. Although the ending has changed, in the original version Kipp's wife has not died and he manages to escape Eel Marsh House only to receive a final visit from the evil Woman In Black at a country fair, it is still in keeping with the despair and helplessness of the original novel and stage play. Fear is what drives all horror films, whatever sub genre you select, it's the hopelessness of the characters plight that produces the shiver down your neck. Fighting with supernatural forces which seek to bring about ruin is something which drives us to carry on watching. The Woman In Black has, at its dark heart, two of the most fundamental fears. Firstly, the death of a child, surely something which every parent dreads, and secondly fear of the unknown, the unknowable. For every parent the most primal of all drives is to protect their child. Therefore, their biggest fear is to have that child ripped away from them. It's part of our DNA! To place this actual reality as The Woman in Black's modus operandi is truly chilling and when you couple that with the fact that she is pretty much unstoppable this, then, is horror indeed. Kipp's arrives at Eel Marsh House to clear up the affairs of the late Mrs Drablow. As a solicitor, it's his job. He is not a snooping child, goaded to enter the haunted house as a rite of passage, neither is he a teenager, trying to find a quiet place for illicit sexiual carryings on with his girlfriend. Kip's enters the house entirely disbelieving of the local tales of haunting and fails to heed the warnings of Keckworth, the local horse and cart owner, who ferries him to Eel Marsh House. The second aspect of fear The Woman In Black so effectively draws on is that of a seemingly unstoppable, unknowable entity. Although the past events that have caused this evil ghost to stalk so many innocent children is explained this does not reduce the horror, in fact it increases it. She is a vengeful ghost, twisted by the loss of her own children, she unleashes her anger on any that catch a glimpse of her. Once Kipp's has seen her his son is doomed. Nothing can stop this turn of events and try though he might eventually The Woman In Black will get what she desires. This pure, unadulterated evil chills. As the supernatural occurrences increase both in volume and in frequency you share in Kipp's horror and also his despair. It is perhaps his own life he is fearful of, he may never be permitted to leave Eel Marsh alive having discovered the terrible secrets held within. So, to a review of the UK Tour itself. The Woman in Black started life, on stage at least, as a two man play (largely due to budget constraints) first performed at the Stephen Joseph Theatre in Scarborough. It transferred to the West End in 1989 and now has toured the UK. The premise of an older Arthur Kipps seeking the help of "The Actor" to aid him in telling his horrific tale to family and friends in ingenious. It is an idea which allows the audience to bypass lack of set and other actors without diminishing the stories abilty to chill. 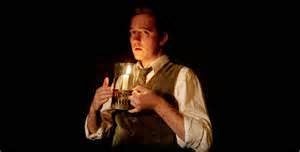 The performance by Malcolm James (Arthur Kipps) was outstanding. Here is a man driven to despair by the constant haunting dreams of his experiences at Eel Marsh House, seeking closure and hoping to lay the ghostly Woman In Black finally to rest. With the insight and skill of The Actor (Matt Connor) Kipps learns how to tell his tale by acting out the events and playing the supporting characters whilst The Actor takes on the role of Kipps himself. The staging for the UK Tour is the same as that you would see at The Fortune, London. Sparse, indeed, an unset theatre stage. We are viewing a rehearsal, a work in progress if you will. It shows the mettle and skill of an actor when he can play so convincingly someone who is not at all a thespian. James achieves this in such a believable fashion that one would think he had never performed at all. But this isn't a simple retelling of Susan Hill's classic ghost story. It works on two levels. Firstly, the telling of The Woman in Black and Kipp's encounter with her is chilling and effective. As The Actor brings to life the story Kipps details so vividly in his journal we are treated to some truly remarkable sound effects and "imagined" moving imagery. The late Nathaniel Drablow's childhood nursery, complete with unoccupied rocking chair is here as is the ghostly horse and cart doomed in the misty marsh. As the tension and ghostly occurrences build The Actor is promised a "surprise" by Kipps. He is truly impressed when a ghostly woman wearing black seems to aid his attempts to bring to life Kipp's account. Here lies the second level and one which was written in specifically for the stage play. The "surprise" that Kipp's alludes to was that he had learnt his lines and he does not see the mysterious women that has impressed The Actor. We learn that on every occasion that the Woman in Black is seen "no matter where or how fleeting, in some horrible unexplained way a child dies" The Actor has a young son and the play ends with the horrible realisation that this whole venture has been a lot more than just a retelling. It is a continuation of The Woman in Blacks vendetta and sooner rather than later "The Actor's" son will die. It is truly amazing that in a day of impressive imagery both in theatre and on screen that a simple two man play with little or no effects or staging can still be so gripping and so chilling. I would urge all fans of fantastic ghost stories to go and see The Woman in Black. If you have seen it before then do so again. Wonderful evening and for a seasoned horror fan I had goose bumps on more than one occasion. The Woman in Black is currently touring the UK and you can click on the link below to see venues and dates.